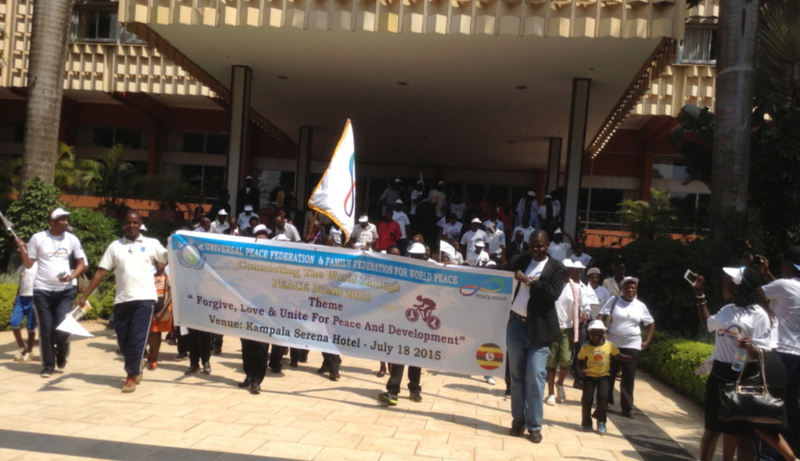 FFWPU Uganda: On July 18 in Kampala Serena Hotel, the Peace Road launching was held in Uganda. Three hundred and forty-seven people participated including 63 from the community, 52 students, 50 cyclists, 14 Christian and Buddhist religious leaders and 18 policemen. We provided an hour and a half orientation on Rev. Moon’s vision including a video and a PowerPoint presentation on the resolution of conflict within families, in which we were able to interact with guests freely. This allowed the guests to tune in to the spirit of Peace Road before the actual rally flagged off at 11:00 A.M.